Thank you to our sponsors, KIND Snacks and Artifact Uprising, two brands we love! You can also get 10% off your order at Artifact Uprising by using AU100CC at checkout. Better hurry! Code expires November 7th. The recordable storybooks from Hallmark. Social Print Studio Instragram poster - I ordered this from my #thegaddboys hashtag, bought a frame at Target and hung it up in their room. They love it! I backup my favorite images on Flickr (you get 1TB of storage FREE!) and I publish my favorite iphone pics to my VSCO journal. For professional prints of all sizes, I love mpix.com. For printing Instragram photos, I use Artifact Uprising (I love their square prints, wood block + prints, and calendar) and Social Print Studio (I love their mini prints, calendar, and posters). I’ve also used Framebridge and loved how my photos turned out! For photo books, I recommend Artifact Uprising or Blurb. Framebridge: "the simple way to custom frame everything you love"
All my Blurb birthday books - I design these in Lightroom and love how they turn out. I've given these as grandparent gifts and they've always been a big hit. After our annual family photos, we pick our favorite eight to frame in the dining room. 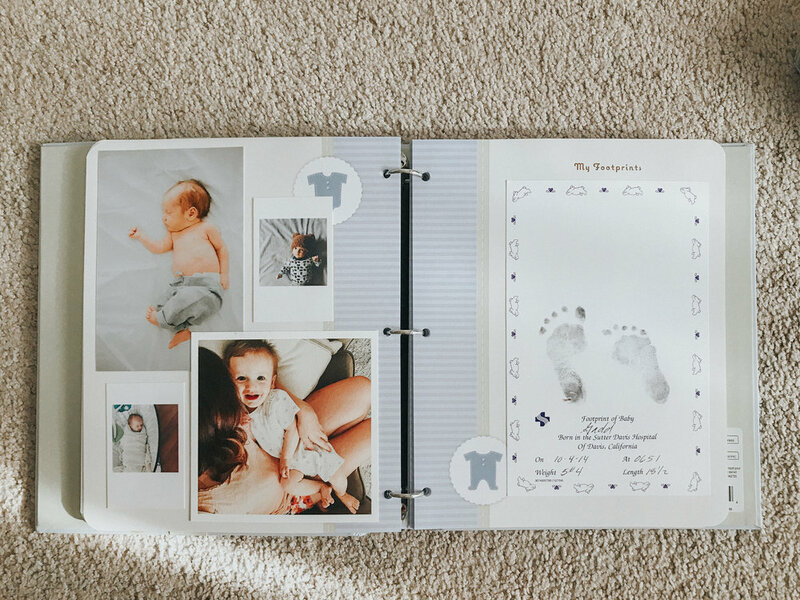 Other photo products I love: the Pinhole Press memory game and the board book of names and faces. In my hallway, I keep two boxes for each kid. I use this as a memory box and this as a photo box, both from The Container Store. 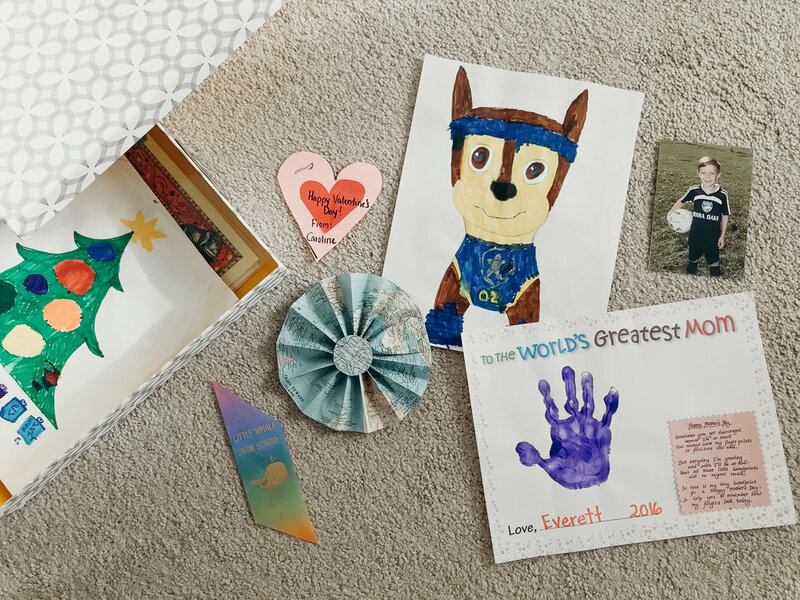 Everett's memory box - things that are special to him (and me!). I'm eventually going to use ArtKive for some of his art projects, but for now, the best ones live in this box. Usually on my kids' birthdays, I order prints of them from the past year and hang them around the house as "birthday banners" - then put the leftovers in this little box for safekeeping. I backup my favorite videos on Vimeo. Sample videos: Everett turns five, Carson turns three, our ten-year wedding anniversary trip to Nicaragua. N'tima, fellow C+C writer, also makes birthday videos. You can see her latest one here. I’ve also done the 1 second everyday and loved doing that for one year, but it’s not something I would do every year because it starts to stress me out if I miss a couple days. While I did buy an official baby book for both my kids (pictured below), I love my Promptly Journals too. I also set up e-mail accounts for both my kids and e-mail them letters on special occasions, like birthdays or the first day of school. Lesley likes Chatbooks and pays for their monthly photo book series where she receives an album each month in the mail. Get yours here. Lesley creates yearly birthday videos for her kids using iMovie, and then uploads the final product to Vimeo to share with family and friends. Here’s one she made this year for Luke. Artkive seems like a great way to save favorite art projects! Legacybox is a great gift idea for grandparents. The service turns old media into new media so you can finally watch all those old VHS tapes from your childhood.